The market now has provided consumers with a lot of healthy food options for those who are health conscious. There are a variety of healthy snacks that are now available in the market to address this need. But consumers still need to be aware that not all so-called healthy snacks in the supermarket are, in fact, really that healthy for you. Here are some of the possible choices that you might encounter. People who are conscious about their weight may prefer drinking diet soda believing that it is a healthier alternative to conventional ones. But studies show that the more one drinks diet soda, the more likely he or she may become overweight. What’s more, the artificial sweeteners used in diet sodas can disrupt the way the body and the brain naturally regulate calorie intake based on sweetness. Drinking diet soda can bring more harm than good. Better alternatives for diet soda include water, club soda, flavored seltzers, and other calorie-free unsweetened beverages. 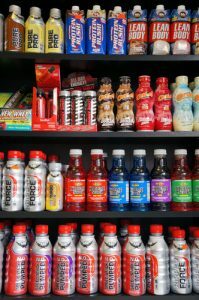 What could be a better complement to a healthy snack than a bottle of sports or vitamin-enriched health drink? Despite such drinks containing vitamins and other nutrients that the body needs, many of them may not be as healthy an option as you think they might be. The main reason is that they contain high amounts of sugar to make them delicious. One drink can sometimes go over the recommended daily sugar consumption for individuals. Water is always the best alternative for active people. Eating energy bars for snacks may seem a healthy choice. It can provide that added energy boost for those who exercise. But not all energy bars may be considered as healthy. Some may contain too much sugar and calories to make them irresistible. The amounts may even be too much for them to be considered as healthy snacks. Some energy bars may just be candy with a glorified name to entice unaware consumers. For an energy bar to be considered as a healthy snack, It should contain no more than 150 calories and should have less than 15 grams of sugar and 2 grams of saturated fat. More than that, then they may no longer be considered as healthy.